The installation – in bark, wood and porcelain – portrays the lifeless form of the stag, moments after the thud, moments after the hunter’s gunshot hits its mark, moments after human interference with the natural world. Another part of the installation shows brittle porcelain antlers in two wire cages used for trapping vermin, another reminder of the conflicting motivations for hunting – necessity and desire; the need for control and the quest for a trophy.Leap III explores the connection between the homeward migrational behaviour of salmon and the effect of human activity and industry on their natural habitat and environment. Fanny Lam Christie is a graduate of sculpture at Edinburgh College of Art, and previously studied painting in Hong Kong. She exhibits regularly, and has received the N. S. MacFarlane Charitable Trust Award 2006 at the 180th annual exhibition of the Royal Scottish Academy, Edinburgh. She lives in Perthshire. Location: a tennis court in the grounds of Monkquell house. This tennis court attracted the artists as a space to work within Heartwood because it is in the process of being colonized by the surrounding woodland and it forms a bounded formal frame within which they could place interrelated pieces. The game of tennis became synonymous with the actions of the artists working together bouncing ideas over the net. 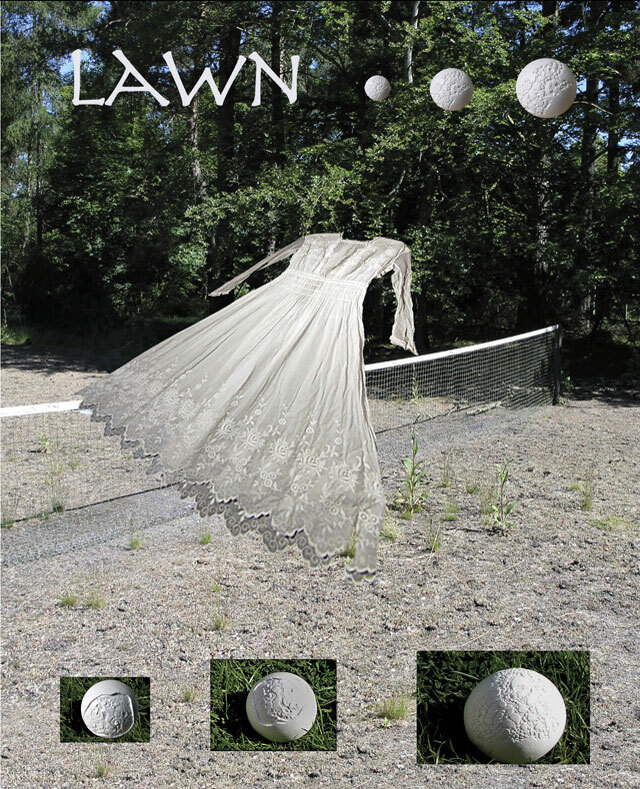 Lawn is a collection of interrelated pieces responding to ideas not only around the game of tennis itself but also around colonization; by nature, of ideas, of the present by the past and of language as in the layered meanings within the word lawn; thin cotton fabric, a clearing in a wood, a closely mown grass expanse. 1.a solid or hollow object that tapers from a circular base to a point. 3.tight array of overlapping scales on a central axis that separate to release the seeds. 4.one of two types of light-sensitive cell in the retina of the eye responsible for sharpness of vision and colour perception. 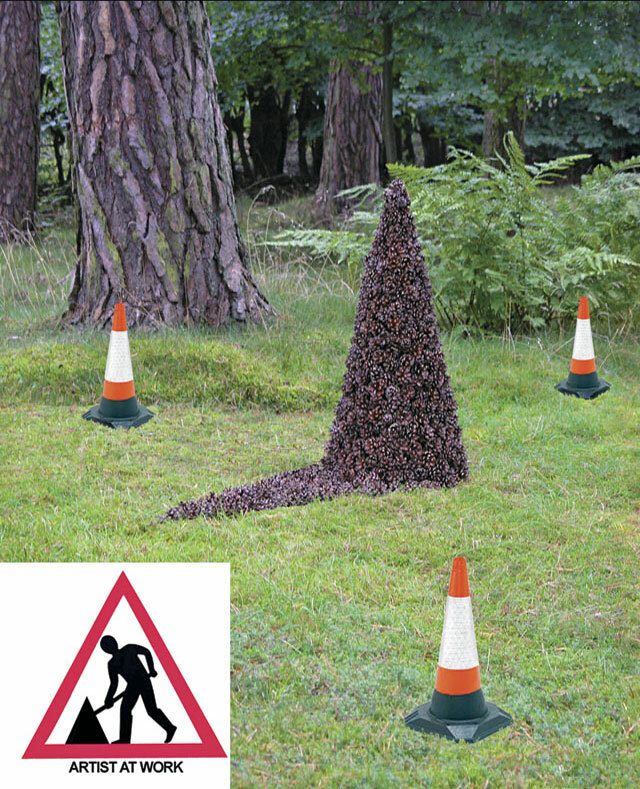 These three definitions of cone all play their part in this installation which is set amongst conifers. The artist is particularly interested in work which is place-specific, believing that each project has its own spirit, flavour, colour and feeling. A graduate BA in fine art Kyra Clegg’s work consists of mixed media installations incorporating sculpture, photography and video. Recent solo exhibitions on the theme of habitation have been shown in Leicester and Shetland and a group International Sculpture Exhibition is touring the USA. 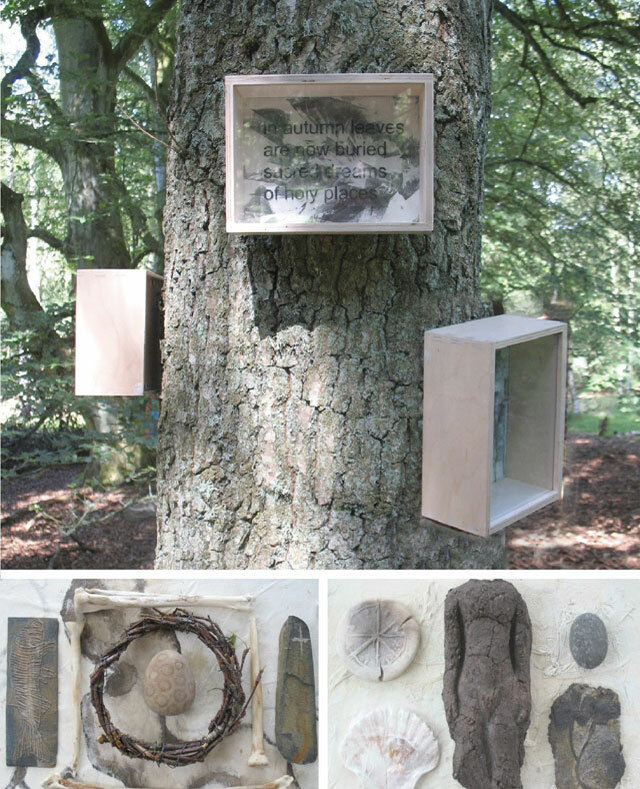 Caroline’s work explores our changing relationship with nature and the natural world. 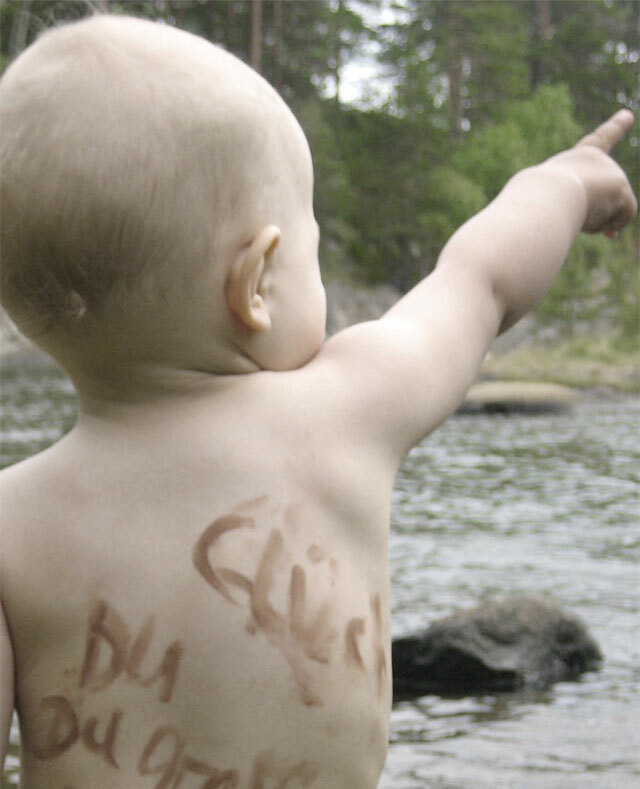 She enjoys unearthing marks of past human presence within a landscape. Caroline’s work has an apparent simplicity, which draws you in to feel deeper the land and place around you. She uses various different media,including; as in this case, moss and native plants. 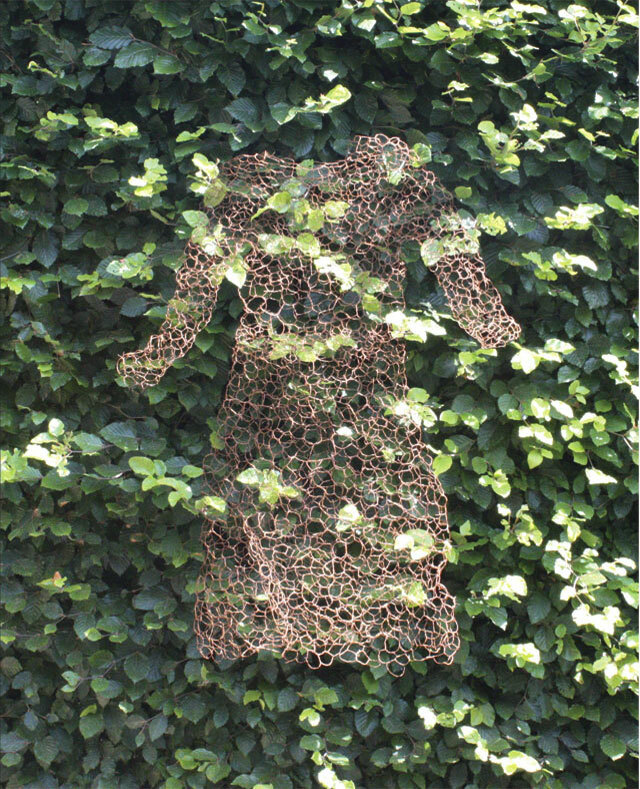 The piece for Heartwood 2009 is a life size ankle length dress made using Hair Moss. The structure of the dress is very open and delicate with the form defined using the thin lines of the moss. 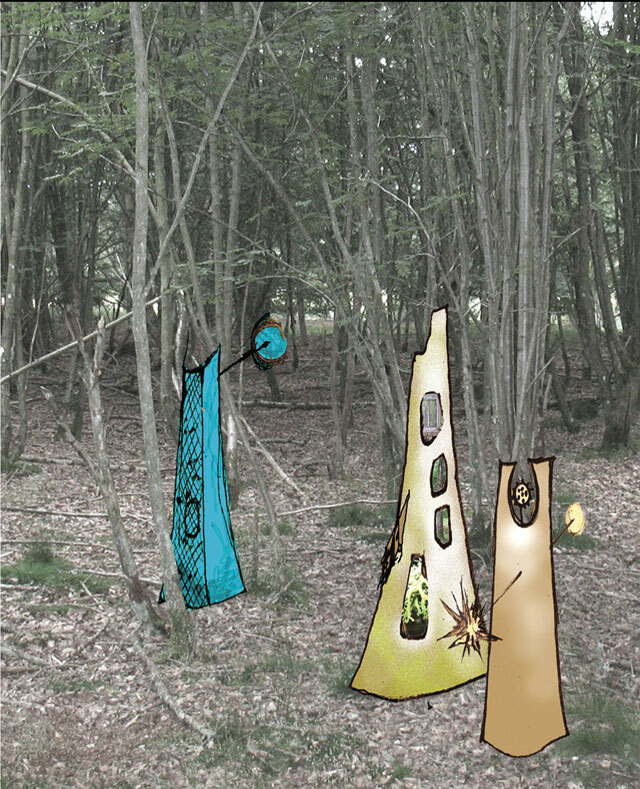 The dress hangs from a branch of a tree and is intended to be a fleeting presence within the wood. It becomes more or less visible depending on the changing light within the woodland and it moves with the wind becoming a living part of the wood. This familiar form becomes a shadow, which triggers connections between the layers of presence, past and present, in this place. Caroline trained as an architect and has worked as an architect and landscape architect. She lives and works on the Isle of Skye. Some recent work includes – Eden court exhibition ‘Wall marks’, work directly on the walls using peat, SAC research grant into peat and ice, Keith commission by HIE, Highland council touring exhibition. ground like autumn leaves. Windfalls made permanent. This brings into play the decorative elements with which we grace our homes with the real world of nature. Underpinning the work are thoughts of artistic and stylistic reproductions taken to ‘stand for‘ the natural order in homes and gardens. When these are placed back into the semi-natural woodland at Heartwood the work challenges the boundary between the wild, the manicured and the stylised forms of nature. Su Grierson graduated Masters of Fine Art from Glasgow School of Art in 1995 having previously received a BA (hons) at Duncan of Jordanstone College of Art . She is Chair of Perthshire Visual Arts Forum and regularly exhibits in Scotland and abroad notably a solo exhibition at Yokohama Art Museum, a Scottish Screen Archivelive award and a recent film project in New Zealand. We live in a time of transition where many feel disoriented by speed of change and loss of roots. We have lost our ability to recognise our place in nature and this has contributed to the present cultural and ecological crisis. Frances Law explores the balance between nature and culture. Operating at the interface between human and nature, she uses a combination of text, found objects – bones, stone, wood – and fired clay re-creating remnants from past lives. Gathering evidence much in the way that an archaeologist might, she offers through her poetic imagery a way of seeing the dualism between nature and spirit. 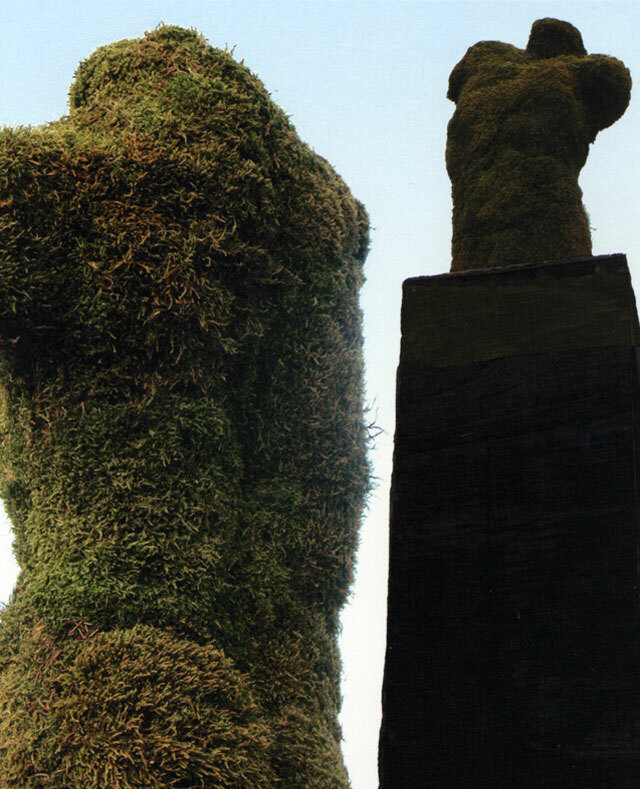 In this piece, created for Heartwood, Frances Law responds to the land, once belonging to the monks from the Abbey at Coupar Angus. By unearthing layers of history and honouring the small and insignificant she reveals the sacredness of place and the timelessness of present and past. Frances Law graduated from Glasgow School of Art in 1980. She has exhibited locally, nationally and internationally. In 2007 her work was represented at the Qi Bashi International Arts Festival in China. Awards and prizes include 1st prize winner of the Scottish National Art Prize 2008 and 2 awards from the Scottish Arts Council. Living on the Perthshire/Angus border she teaches part-time at Dundee University. 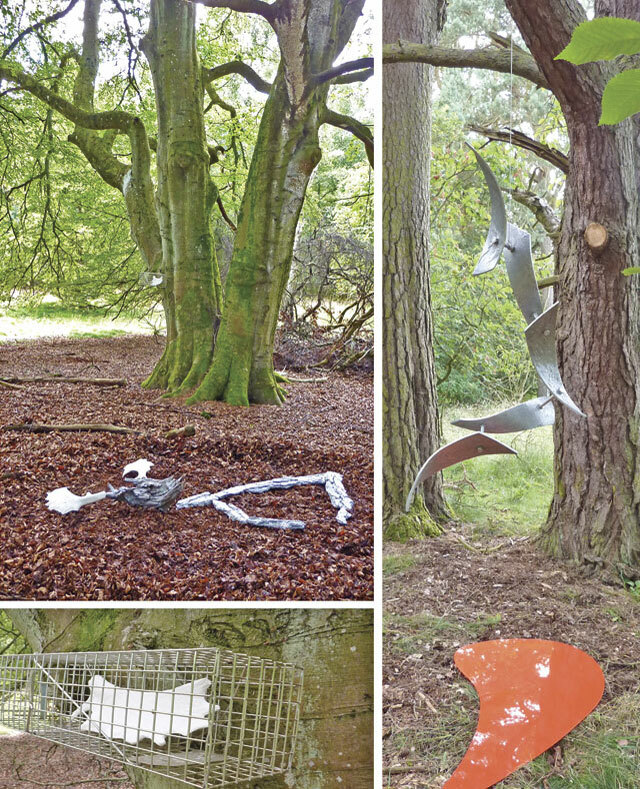 A mossy transformation occurs as Shona’s figurative work moves out of a gallery setting into the natural environment, setting it free in the beautiful setting of the Monkquell woods.This installation project in the forest inspired Shona, who’s latest exhibition work is figurative, to incorporate the natural environment onto the work; blending the natural art that is found around a forest with that of a sculpted torso. Competing with nature’s own art is the ultimate challenge for Shona and this piece attempts to combine both the work of nature with the work of the artist. Shona Leitch BA hons (b.1967) graduated from Grays School of Art, Aberdeen in 1991. She exhibits and has work in public and private collections around the UK and internationally. Working from her Perthshire studio creating sculptural work, she enjoys seeing her work outdoors, which is the environment that is source for so much of her sculpture. Shona has also been teaching ceramics and life sculpting over the past decade to a wide range of people and enjoys sharing her expertise with others. Texting [the exchange of brief written messages between mobile phones] is often vilified as a pernicious threat to standard written English with its truncating of words (luv U hon ) and interspersing of letters with signs and numbers for speed and expediency (wat ru ^2? ). But such shortcuts are nothing new. Codes, shorthand, even nautical flags are just some of the many varied methods used over centuries to impart information within restricted time and space. Texting is a logical byproduct of our frenetic world. Conveniently, there is no need of a decoder to master the basics, the context provides the key. My practice spans visual, sonic and written media and I find alternative forms of communication fascinating.The telephone pole immediately caught my eye while walking around the Monkquell woodlands. Naked and linear, it stood out, incongruous, like the forlorn mast of some long gone ship. It suggested both old and new technology. For this installation, I have made replicas of flags from the International Code of Signals,laboriously joining them together according to nautical conventions, in sharp contrast with the speed of texting. A decoder is placed nearby to enable visitors to decipher the message. French born and Edinburgh based, Martine Foltier Pugh graduated in Sculpture from Edinburgh College of Art in 2006. 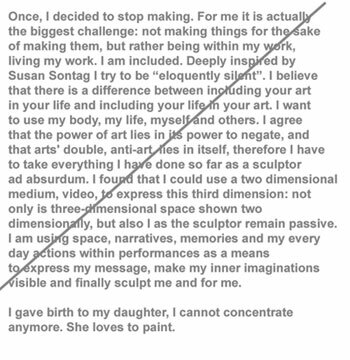 She then completed the MA in Contemporary Art Theory and is currently researching for an MPhil in Visual Studies. 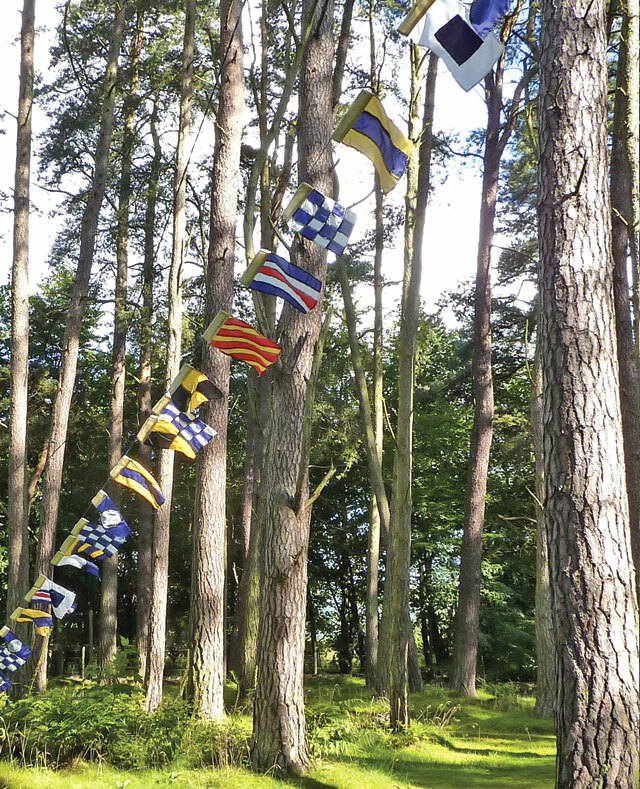 Over the past four years, she has exhibited textile and sound site-specific installations in Edinburgh and South East Scotland. Nadja Schrade was born in 1971 in Munich. After her law studies she studied sculpture at Edinburgh College of Art and Rhode Island School of Design and graduated in 2004. Nadja Schrade lives close to Munich and now mainly works conceptually. SVOP/T – Ut pa tur, aldri sur! SVOP/T would like to introduce the Scottish audience to the genuine Norwegian outdoor experience. 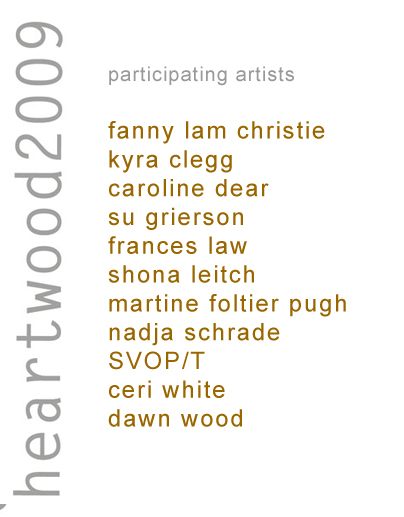 Visitors to the Heartwood Art Trail will have the chance to borrow a fitted hikers’ kit containing what the artists of svop/t perceive as more or less compulsory gear for a Norwegian embrace of Mother Nature. Ever since the Outdoor Recreation Act of 1957 (including the Public right of access), and even long before that, Norwegians started to single out the ingredients that it is now taken for granted will best serve the hiker. 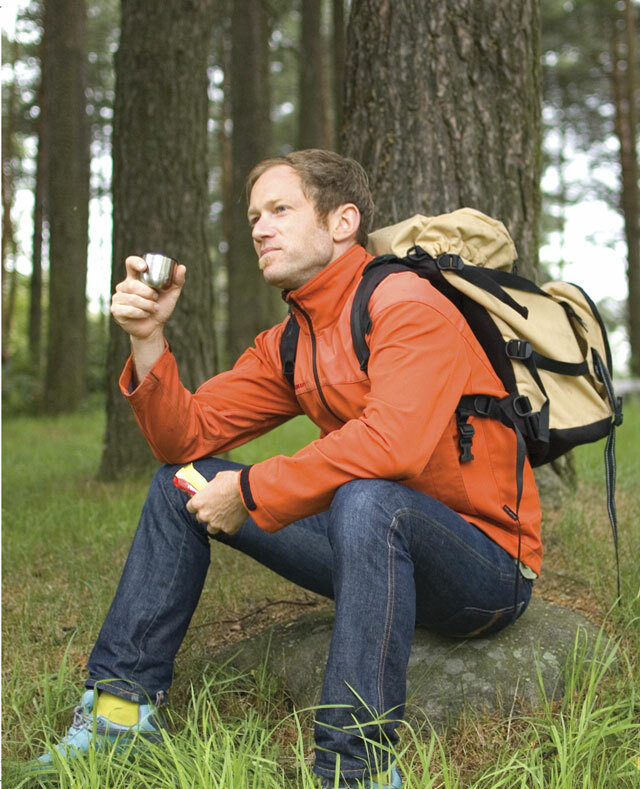 These ingredients are rarely varied, and although challenged the last few years by new things, they remain the most reliable parts of a successful hike. An informational brochure will be provided, with tips and hints on how to utilize the kit to its fullest potential; if it is something that any Norwegian is absolutely confident of, it’s that nobody knows how to enjoy nature quite as well as we do! 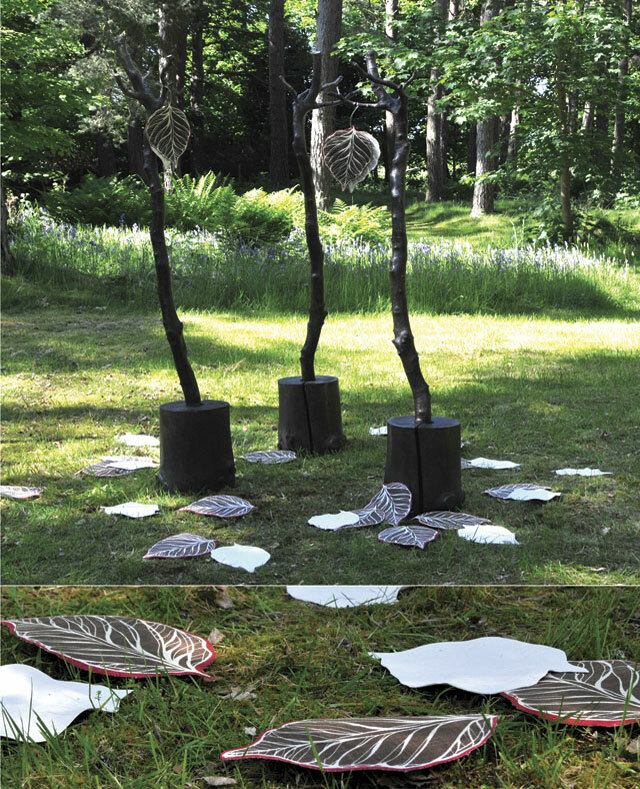 SVOP/T invite the visitors to The Heartwood Art Trail to take a hike through the woods – the Norwegian way. Svop/t is composed of two Norwegian artists and an Italian architect. Together they work on projects that combine their interests in art, design, architecture, site specific work, spatial relations and interventions. Inspired by the forest and its immediate surroundings Ceri’s work here explores close-up natural detail, fascinating, minute discoveries and the personal imaginings suggested by this particular environment. Spend long enough in this place and simplicity once again can seem possible: times of childhood, perhaps, when the forest became a sun-dappled playground; a secret domain; a place of alarming insect life; somewhere spooky. She has tried to reflect the artist’s /designer’s eye as it absorbs these surroundings … however, under these circumstances, the 10 year old in Ceri is never really that far away… just out of sight… maybe behind that tree… Clay is her primary medium but for this occasion she’s making a rare foray into mixed media… surely it’s easier? A graduate of Gray’s School of Art, Ceri now designs and produces a wide range of contemporary and quirky ceramic ware. She draws inspiration from her 1970’s suburban childhood, urban architectural detail, wildlife of any kind and having a sense of humour. The theme for the work ‘Congregation’, is that of Saint Francis of Assisi preaching to the birds. 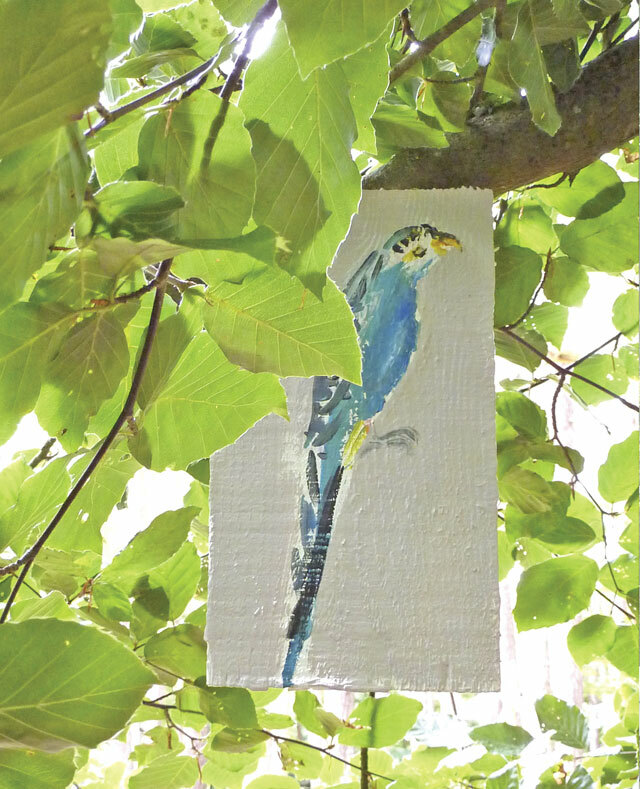 This collection consists of a bird-box and sixteen birds. Some of the birds are based on reality, although not all of these species would naturally occur at Monkquell, and there is a phoenix amongst them. The paintings are in oil, on off-cuts of wood from a local sawmill.The work is part of a series of paintings based on Saints who had a close relationship with the natural world, particularly Saint Francis and Saint Brigid. Dawn Wood lives in Perthshire, and works as a science lecturer at the University of Abertay, Dundee. Dawn is a self-trained artist and her themes are informed by sketching animals and birds, both in the wild, and at Dundee City’s Natural History Collection. She is also a poet, publishing with Templar Poetry.